CBS Denver reporter Tim Wieland in Denver tweeted Monday that Bennet would skip the debate that was scheduled for next month. "Darryl Glenn never engaged with our campaign to have a substantive conversation about debates and has instead blacklisted Colorado news reporters and become the first Senate candidate this millennium to refuse to do the traditional Denver Post debate," a spokesperson for Bennet's campaign told the Washington Free Beacon. "At this point we are moving forward with our campaign schedule and look forward to the remaining televised debate and joint appearances that have already been scheduled." "With Michael Bennet backing out of the CBS4 Debate, it's clear that Michael Bennet is running scared from Darryl Glenn," said Katey Price, a spokesman for the Glenn campaign. "He sees the polls showing a tight race and doesn't want to defend his abysmal record– the fact that he's put this nation at risk with his vote on the Iran Nuclear Deal and that his deciding vote for Obamacare has been disastrous for Colorado families." Advancing Colorado, a free market nonprofit organization, blasted Bennet for declining to debate Glenn. "Bennet is like a fugitive on the run, scared of his own lethal record that has jeopardized American lives and security," said Jonathan Lockwood, chief of Advancing Colorado. 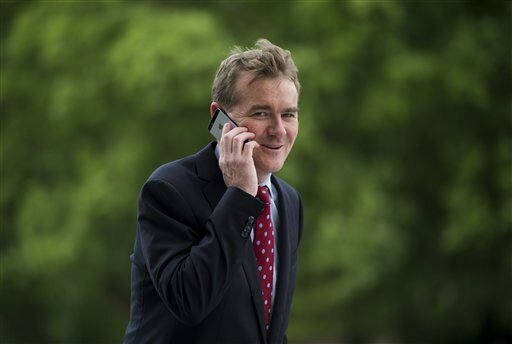 "Bennet needs to show up and face Coloradans who deserve answers on why he adamantly supports giving Iran billions in cash, letting terrorists loose from Gitmo and why he voted against increased screening of so-called refugees." Update 6:20 P.M.: This post has been updated to reflect comment from the Bennet and Glenn campaign.